Secretary of State Rex Tillerson steps off the plane as he arrives, Monday, Oct. 23, 2017, at Al-Udeid Air Base, Qatar. Tillerson is returning from a trip to Afghanistan. Far from the Washington murmurs about his future, U.S. Secretary of State Rex Tillerson secretly traveled to two of America's enduring war zones Monday, prodding leaders in Afghanistan and Iraq to reach out to longtime rivals. 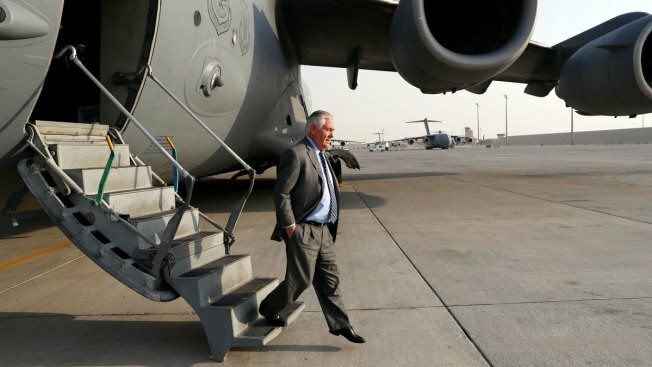 Tillerson flew on a C-17 military transport plane from Qatar into Afghanistan's Bagram Air Base, where he met President Ashraf Ghani and other Afghan leaders. After returning to Qatar, he departed for Baghdad for talks with Prime Minister Haider al-Abadi for the second time in as many days. They discussed healing a Kurdish fight with the central government, accelerating post-Islamic State reconstruction projects for Iraq's liberated towns and cities, and more. For Tillerson, the journey to a pair of the world's most dangerous countries represented an escape from a bruising few weeks of political scrutiny at home. The former Exxon Mobil CEO has been on the defensive ever since reports claimed he called his boss, President Donald Trump, a "moron" after a contentious national security meeting this summer, fueling speculation that he might be the next top Trump aide to leave an administration beset by high-profile departures. Tillerson slipped out of Doha before dawn. Few outside his inner circle were aware of the plans. Only a few journalists were allowed to accompany him and they were prevented from sharing any information until Tillerson was about to depart. He spent about 2½ hours in Afghanistan. 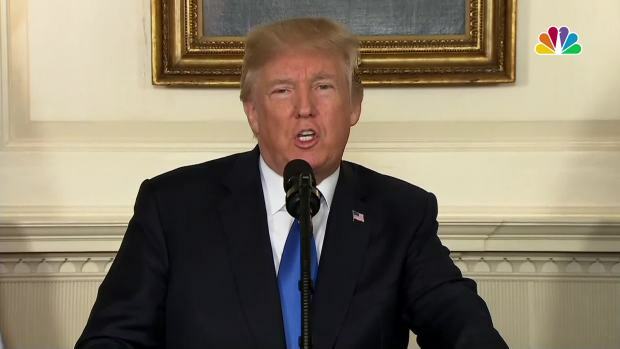 "We will not continue down a path whose predictable conclusion is more violence, more terror and the very real threat of Iran's nuclear breakout," President Donald Trump said on Friday, Oct. 13, 2017. His primary message: support for a declaration that some Taliban leaders could join Afghanistan's government if they renounce violence and terrorism and commit to stability. He also bluntly warned neighboring Pakistan to step up action against militant groups that find haven within its borders. "Clearly, we have to continue to fight against the Taliban, against others, in order for them to understand they will never win a military victory," Tillerson said at Bagram, where he met Ghani, Chief Executive Abdullah Abdullah and other senior Afghan officials. "And there are, we believe, moderate voices among the Taliban, voices that do not want to continue to fight forever. They don't want their children to fight forever. So we are looking to engage with those voices." "There's a place for them in the government if they are ready to come, renouncing terrorism, renouncing violence and being committed to a stable prosperous Afghanistan," Tillerson said. Tillerson outlined the Trump administration's new policy for Afghanistan and its region, which centers on defeating extremist organizations that might threaten the United States. The new strategy incorporates goals for Pakistan and India, too, both of which he'll visit this week. Tillerson said the objective is to deny haven to terrorists anywhere in South Asia. The biggest challenge is Pakistan, a country the United States has devoted years and billions of dollars toward helping defeat the Taliban, al-Qaida and now even Islamic State fighters and affiliated groups. Tillerson will visit Islamabad on Tuesday and tell Pakistani leaders that driving extremists from their hideouts on their territory is imperative to a good relationship with Washington. "Pakistan needs to, I think, take a clear-eyed view of the situation that they are confronted with in terms of the number of terrorist organizations that find safe haven inside of Pakistan," he said. "So we want to work closely with Pakistan to create a more stable and secure Pakistan as well." President Donald Trump’s cryptic comment as he posed for pictures with top military leaders Thursday is drawing scrutiny. "You guys know what this represents, maybe it's the calm before the storm," Trump told reporters as he posed for photos with senior military leaders. Trump didn't clarify the remark, which some speculated could refer to either action against North Korea's nuclear weapons program or a withdrawal from the Iran nuclear pact. Hours later, Tillerson dealt with different security problems in Iraq. The Arab country has scored major, U.S.-backed military successes against IS in recent months, but is reeling from its own persistent ethnic and religious divisions. The most recent: a resurgent Kurdish independence movement in northern Iraq, where a widely criticized independence referendum last month has sparked tensions within the country and with neighbors. "We did not support the Kurdish independence referendum," Tillerson said at a news conference with Qatar's foreign minister in Doha on Sunday, before visiting Baghdad the next day. "We did not believe it was time given that the battle to defeat ISIS is still under way. And while there have been significant victories and significant progress in Iraq, that task is not yet complete." Still, he said the Kurds have legitimate grievances that should be addressed within the framework of a unified Iraq. Calling for restraint on all sides, Tillerson said he believed al-Abadi was committed to resolving Kurdish complaints. "The Kurdish people have a number of unfulfilled expectations, rights that were promised them under the constitution that were never delivered upon, and so there are a number of actions that need to be taken," he said. He cautioned everyone that the war to defeat the IS group is not yet over and that remains the greatest threat to Iraq."